Bloomerang found that for every 100 donors gained by nonprofits in 2016, 99 were lost due to attrition. That is an astounding number, and one that should be sending chills down the spine of every single development director! The reason for this high level of attrition is that nonprofits tend to do a poor job of keeping donors informed about the impact and the results of their gift. Instead, we bombard our donors with requests for more money, sending them boring and irrelevant announcements and notifications, or even worse – not communicating with them at all. Creating short, simple thank you videos and sharing them regularly can help combat donor fatigue and deepen relationships, leading to a long-term partnerships. However, a pervasive myth continues to prevent many nonprofits, especially small ones, from making these videos – the myth is that effective Thank You videos have to be expensive, fancy masterpieces! The reality is that in the age of smartphones, we are all content creators and media companies – we all have the power to create and share video, literally in the palm of our hands. The videos do not have to be long, at least when you are starting out with video. Giving an inside glimpse into the school is an added benefit, and certainly more memorable and compelling than having someone speaking at the camera for 20 minutes. In this post, and in an upcoming live webinar, I will detail how your small nonprofit can create your own short thank you video to delight your donors and make them want to give again. It’s true that there are several unique challenges faced by nonprofit organizations, especially small ones, when creating and sharing video. One main challenge is lack of technical knowledge and training, and serious lack of resources and staff capacity. The good news is that you can create a DIY video for your donors just using your smartphone! Ensure that sound is good by using a clip-on lavalier mic for an interview, or make sure you are in a place with little ambient noise. Good lighting is key – natural light is your friend! Getting outside or being near windows with lots of natural light is the best option. Open up the camera app on your phone and start recording. Make sure that you are not in a place where the lighting will change dramatically, which has a big impact on smartphone cameras because they have smaller image sensors and lenses. You can also film your video using the free apps available in Instagram or Snapchat. After recording the video, add filters, text overlay, even stickers, and download the video to your phone. You can then share this video on other platforms. Use mobile apps for further editing and enhancements. This app allows you to trim a video clip, create subtitles and text, speed up the content, add filters, and add overlays. You can add music to the video, which will play in the background. You can also add different themes, like a Charlie Chaplin theme or the Totally 80s, which adds relevant visual effects and, in some cases, music. Instantly transform your photos and video clips into stylized videos. Snap 3 pictures. Add captions. Choose graphics. Nutshell creates fun mini-movies for you in seconds using just these few elements. For your mini-movie, Nutshell will even create an audio track for you using the sounds that were captured when the three photos were snapped. Pricing: free (with Nutshell branding added to the video). Search for it in the App store. Carefully plan the first seconds of the video. You only have a split second to catch your donor’s attention and get them to view the video. Don’t waste it with splashy themes, credits, and your logo. Start with a compelling story or someone speaking on the screen, and save your website and contact information for the end of the video. Start collecting and sharing your best stories! 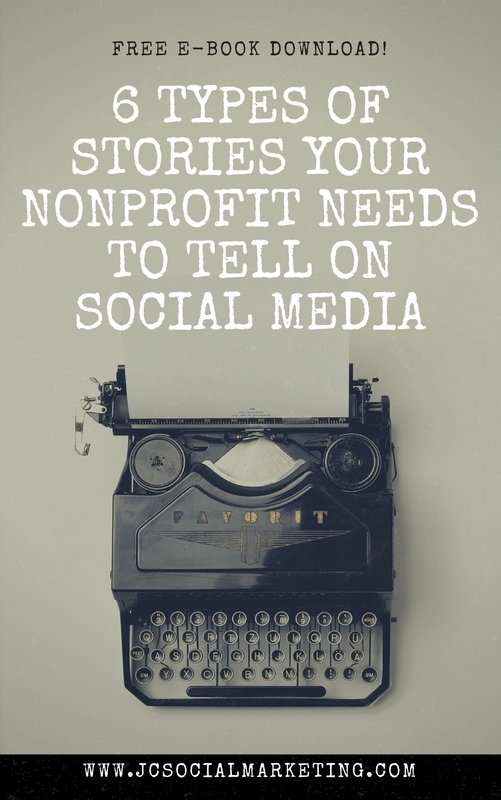 Get your very own copy of my new e-book, 6 Types of Stories Your Nonprofit Needs to Share On Social Media!